Harry Neyland was born in 1877 in McKean, Pennsylvania mostly working as a painter, sculptor, illustrator, and copyist. 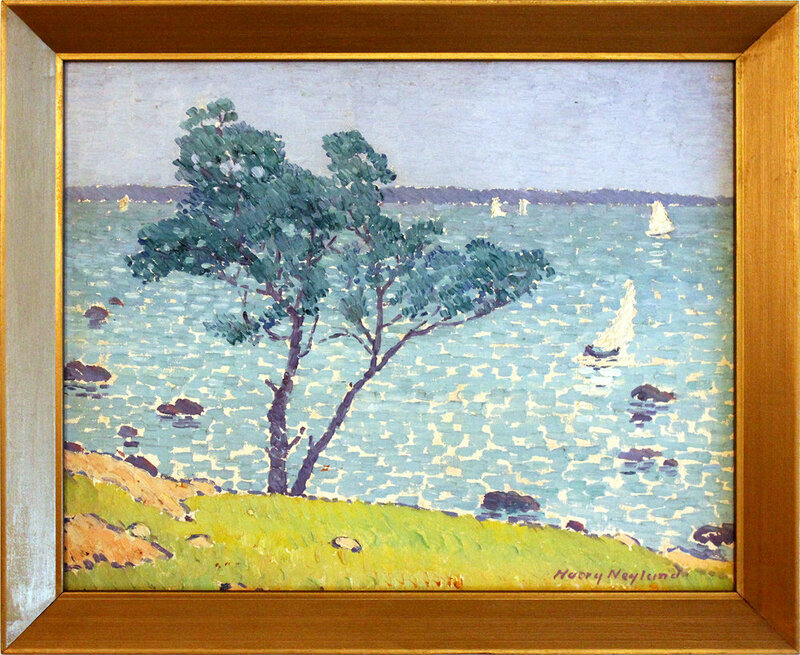 As an American Impressionistic artist, his compositions were of a variety genre, consisting of landscapes, townscapes, ships, marine, harbors, and London and Paris scenes. Neyland's artistic education took place fist at the Zanerian Art College in Columbus, Ohio, then at the Art Students League in New York City; and later at the Academy Julien in Paris. He was a member of the Providence Art Club in Rhode Island. As he was an expert on the whaling industry, Neyland would accompany an exhibit of marine paintings with lectures on whaling and ships. Published in a 1948 Lowell "Telegraph" article, he had a solo show of over seventy stately ship paintings at the Whistler House Museum of Art and presented his own forty-five-minute motion picture of the whaling days and recent times of New Bedford. In the article stated that Neyland was a resident of the New Bedford vicinity since 1911 and, until the hurricane of 1938, maintained a studio on Cuttyhunk, an island at the entrance to New Bedford Harbor. Neyland illustrated Cap'n George Fred published in 1929 by Doubleday, Doran and Co. Other illustration works include Surf and Sunlight, of Hudson Motor Car Co.; The Wanderers, Pratt Institute, Brooklyn, NY; Furled Sails, Drying Sails, The Huntress of the North, Country Club, New Bedford, Massachusetts, and memorial tablets for Whaling Enshrined, Inc. His works can be found at the Whistler House Museum of Art in Lowell, Massachusetts, at the Mariner's Museum in Newport News, Virginia, also the Old Dartmouth Historic District, the Mystic Seaport Museum in Connecticut, and the Kendall Whaling Museum in Sharon, Massachusetts. Neyland died in Dartmouth, Massachusetts in 1958.